We’ll be talkin’ about Takins at this Ask a Keeper presentation. 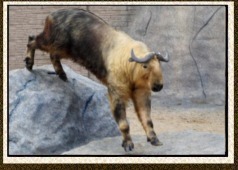 Takins are large muscular hoofed animals with impressive horns and are thought to be a national treasure in China. This is your opportunity to learn what makes them so special! Daily Presentations run Memorial Day thru Labor Day. Presentation will be held in front of the Takin exhibit on the Asian Trail.